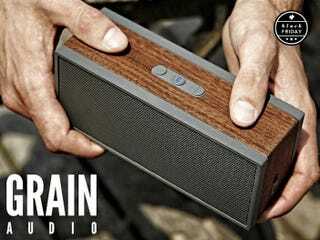 For a short time, Gizmodo readers can get one of the most unique, high-end bluetooth speakers on the market – Grain Audio's PWS – for 10% off plus free shipping with the StackSocial code "gizten". This deal is limited to 100 units, so grab one quick! The Grain Audio PWS is always $250, but Gizmodo readers can get 10% off (taking it to $225) by using the StackSocial coupon "gizten". It includes FREE shipping inside the US. StackSocial curates exclusive deals on trending and innovative products. They've partnered with the commerce team to bring you these specials. So to be clear, this post is not editorial and we make money on sales.